The spotlight on netbooks has pretty much faded these days. 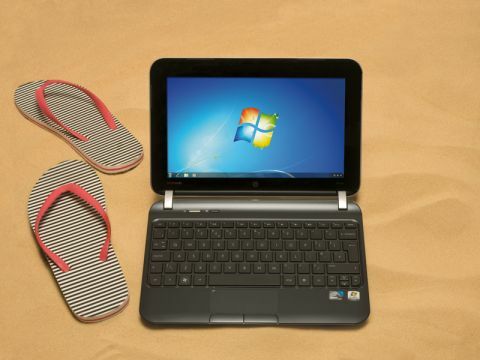 But these stripped-down laptops offer an excellent alternative choice when considering a potential holiday companion. The HP Mini Beats 210-3025sa will offer you basic performance and a pretty decent battery life wrapped up in a chassis that is light, portable and perfect for taking on your travels. As netbooks go, the HP Mini Beats is a bit of a looker. The smooth black and silver chassis has plenty of curves and isn't plastered with stickers or markings. Even the recognizable Beats audio branding is limited to a small logo on the screen bezel. The all-black isolation keyboard also looks great. Unfortunately, like other netbooks, typing is a bit of a cramped affair. We preferred the experience of the Eee Pad Slider's slide-out keyboard to the HP Mini Beats. Another sour point is that while the screen is bright and crisp, the bezel we mentioned earlier is particularly thick and a little distracting. Other netbooks, such as the Samsung NC110 have managed to cut the bezel size to improve the screen and we'd have liked to have seen that here. Predictably, the smaller 10.1-inch screen means a lesser resolution of 1,024 x 600 pixels - matching the Asus Eee Pad Slider for density. If you plan to use the HP Mini Beats to enjoy TV, movies or music then it's worth investing in some good headphones to get the most out of the Beats audio. We've seen this technology in other HP machines and while the netbook speakers produce an admirable amount of volume and depth, for the best results you'll need to use the headphone socket. Performance is not one of the HP Mini Beats' strong points. On board is a dual-core Intel Atom N570 1.6GHz chip and only 1GB of RAM. The result is that browsing the Windows 7 Starter OS is usually smooth and easy until you start multitasking heavily. Then there's some slowdown and, on a few occasions, we had folders become unresponsive. If you have a lot of media then the 250GB hard drive might seem a bit small, but this is on the more generous side of netbook storage. HP has done a commendable job on the connectivity of the Mini Beats; you've got three USB ports, a VGA connection and an Ethernet port as well as a 2-in-1 card reader for adding extra storage space. You can use the 802.11n built-in wireless to surf the web and use the Bluetooth for wirelessly connecting peripherals like headphones. It's easy to recommend this device when it comes to portability. And because it runs on Windows, there's a much wider choice of software available than in app stores, too. The HP Mini Beats sits between the Lenovo Z570 and the Asus Eee Pad Slider and we still reckon the netbook platform has something to offer. However, if you're looking for power or portability we'd take the plunge on the Lenovo or the Asus rather than settling for something in between.